As my wife and I wanted an operating steam boat in our life time, it made sense to search out and have a reputable company to build a complete boat. We are extremely happy with the end result, namely "Dragonfire". The boat was delivered this past May 5, 1997 and has steamed every day except 12 since. Boat Length Overall 21 feet, 3 inches, Beam 5 feet, 10 inches, draft 1 ft 10 inches and a weight of 1300 pounds. The draft and weight is for the bare fiberglass hull as it comes from the mold. 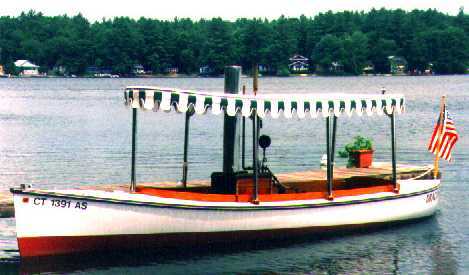 It is a reproduction of a 21' Truscott "Compromise" hull and is manufactured by Beckmann in Rhode Island. The boat canopy is molded fiberglass with a fringe added. The Truscott Boat Manufacturing Company of St. Joseph, Michigan designed this hull in 1902 as a compromise between the Fantail and Torpedo models, claiming to have eliminated all the bad features of both while retaining all the good. Truscott went out of business in 1948. The original hull that the plug mold was made from was manufactured in 1904. The boat is powered by a Semple 3 X 4 double acting single cylinder condensing engine producing about 5 h.p. The brass propeller is a three blade, 20 X 28. Best estimated speed, with 120 pounds on the gage is 6.5 kits. The boiler is a Horizontal water tube type with 10 3/8" copper tubes on each mud drum and with each tube making three passes under the steam dome before connecting. Down comers are attached to the steam dome and the mud drums. The mud drums are connected in the rear of the boiler. Pressure relief valve is set at 150 psi. Heat is provided by a converted domestic type oil burner. The 115 volt 1725 rpm motor was replaced by a 12 volt d.c. motor, while the 115 volt, primary, with secondary of 10,000 volts each leg transformer was replaced by a 12 volt d.c. spark coil. This combination provides power to turn a Sundstrand mini pump at 100 psig, combustion air and spark to ignite the fuel spray. The boiler was manufactured by Beckmann and the oil burner was also converted by them. From a cold start, I can have 80 psi pressure in 15 minutes. Mr. Walter Beckmann is President & Master Carpenter. Lloyd Beckmann runs the small boat shop and actually builds the boats. In our case the Beckman's built the entire boat including the water tube boiler. Boat completed, with feed water (12 Gallons), # 2 fuel oil (10 gallons), boiler, burner, engine, piping seats, batteries (2 of 600 amp hr rating) canopy etc. is around 2,500 pounds and draws 26 inches. The entire package comes with a single axle trailer for towing. Connecticut Motor Vehicle Law allows trailers below 3,000 lb. to be without brakes. Having towed camper trailers and trailers hauling 8,000 gallons of fuel oil/kerosine, I opted for the extra cost of a surge brake.